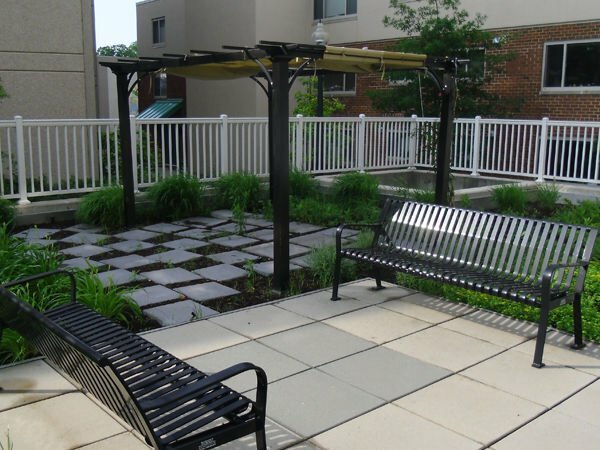 Johnson’s Landscaping Service, Inc. designs and builds residential and commercial landscaping across Montgomery County, Howard County, Northwest D.C., and Northeast D.C. Since 1960, we’ve been a growing family tradition because of our strong commitment to quality service. Our unique 5-step system makes your voice heard, so you get exactly the landscape you want. Connect with our landscape designer and discuss the scope of work and investment level. Receive your custom proposal. Our expert landscape designer will dig deep into your ideas and offer suggestions to make them a reality. 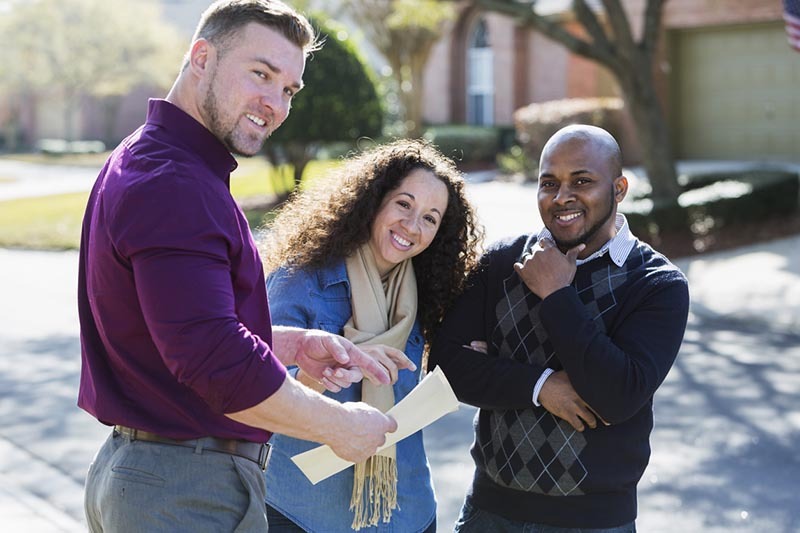 Give your feedback on the plan and make adjustments. Our expert teams install your project to-specification and on-time. Review the project and get a tailored site maintenance plan. Free Landscape Maintenance with Installation! 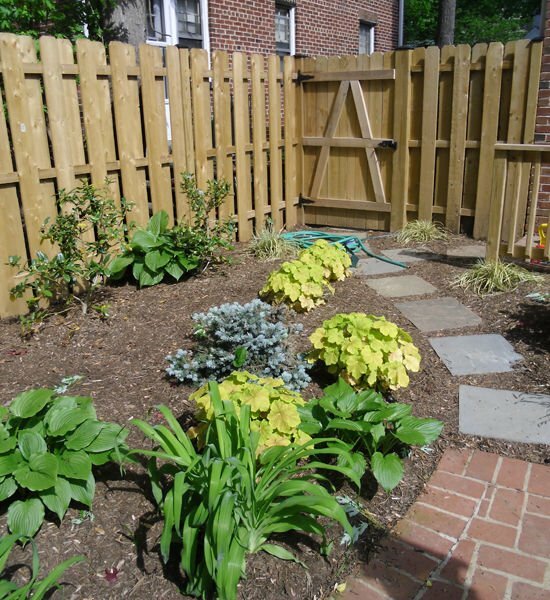 Since 1960, the Johnsons have devoted themselves to giving great landscaping services to Northwest D.C., Bethesda, Chevy Chase, Kensington, Silver Spring, Rockville, Potomac and Olney. Jim Johnson opened Johnson’s Landscaping Service over 50 years ago with a vision of top-quality service at affordable prices. That’s why most of our business comes from referrals and past customers! It’s a testament to value of quality landscape design that lasts for years. Jim’s sons Jimmy, Charlie, and Matt now strive to continue to uphold their standards for landscaping excellence. Johnson’s Landscaping Service, Inc. is poised to continue serving the customers of the Washington, D.C. area into the next generation. We’re here for you today, and we’ll be here for you tomorrow. Customers keep coming back because we ensure quality service. 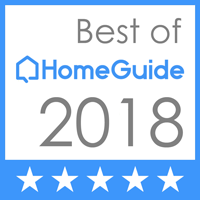 Our design team is the best in the area, with degrees from the University of Maryland, George Washington University, Penn State University and Ball State University. Collectively, they have over a century of landscape design experience. Our team solves problems with creative methods that save you money. Often, clients call us and aren’t exactly sure what they want. They rely on our visionary designers to help them solve issues such as cramped backyards or water pooling. We take our solutions to the next level and build dazzling features that double as problem-solvers. 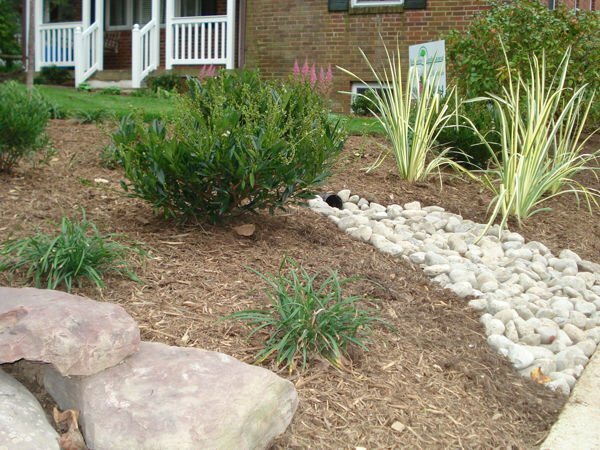 Why just install a French drain when you can add some panache and make it a dry creek bed? 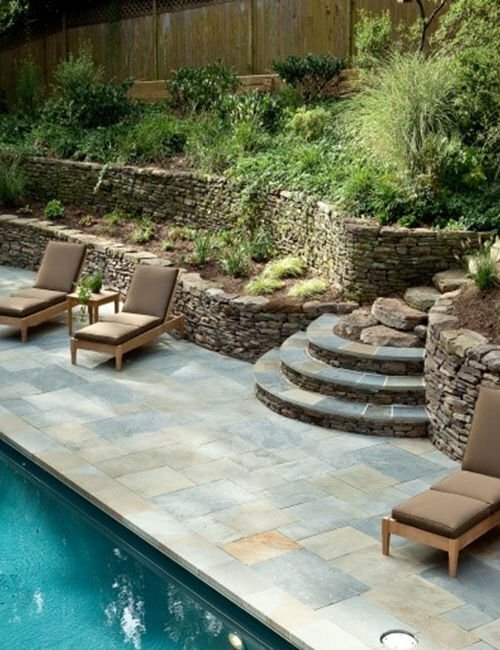 Why settle for a simple retaining wall when you can have a raised seating area with a firepit? Our team looks at your yard not as a collection of obstacles, but as an array of opportunities. Our Customers Love the Results we Deliver! 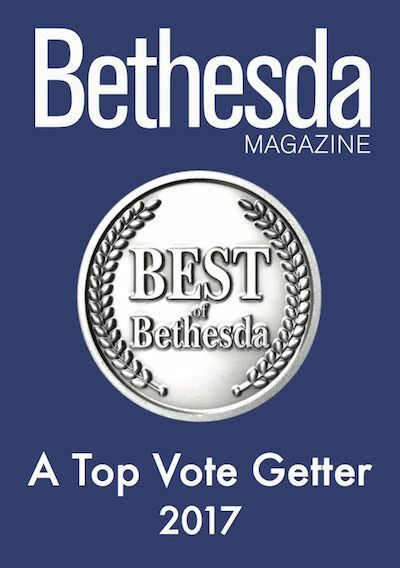 You never get less than our best. 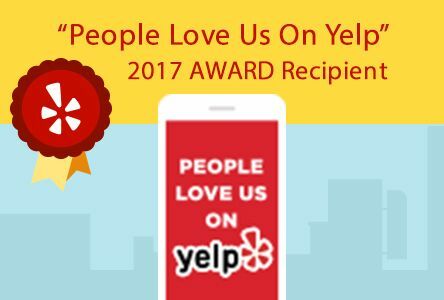 It shows in our reviews. I have been working with Johnson’s Landscaping Services for many years and I could not be happier. Jamie Newell is my designer and he is fantastic. Jamie is creative, flexible and provides great customer service. I was fairly clueless about how to design a garden and he helped me every step of the way. My expectations were exceeded and my garden and front yard received endless compliments. When I sold my house, leaving my beautiful yard was the thing that was the hardest. I can’t wait to get started on my new project with Johnson’s at my new home! 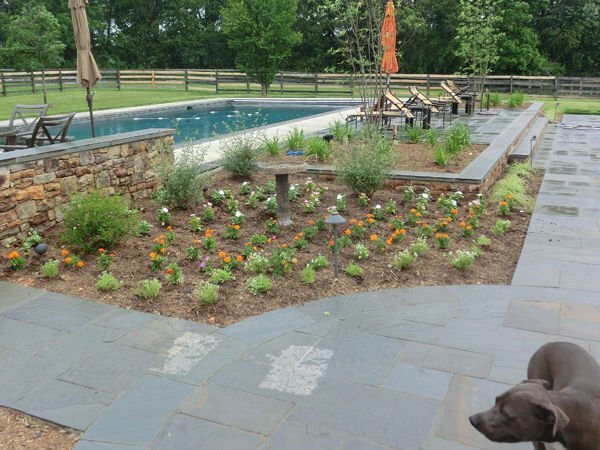 Julie P.
Johnson’s Landscaping is the BEST – I have used them for over a decade now, for both hardscapes (patios, walkways, etc) as well as plantings. They are the best – reasonable prices, super-excellent work, very reliable. Thank you! Jennifer S.
Repeat business is critical to Johnson’s Landscaping. That’s why our 5-step process includes so much communication. Through clear dialogue, we hammer out the finer points of our clients’ visions. We make sure we get the details perfect before we even start the work. Great company, great service! We used Johnson's for a patio and some other hardscapes and they did a great job at a reasonable price. Their crew worked quickly but efficiently and was very conscientious in following best practices. Our renovated front lawn looks great! Johnson's did a brilliant job restoring our driveway--installing pavers which compliment the overall decor (and indeed look as if they are of the same vintage as the house) and a beautiful gravel circular drive. Johnson and Sons did a great job with removing the leaves at my house. Will you again! geniality of crew & supervisor Joe Petrucelli, who has provided a great deal of hands-on help. I recommend them highly, they are professional and responsive, while taking a personal interest in their client's requests and concerns. Great service and great work at fair prices. 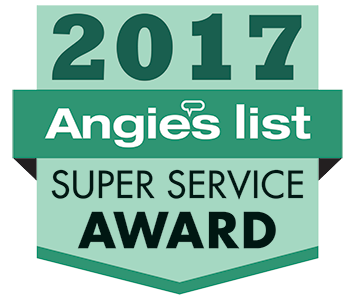 Jamie helped design wonderful landscaping for both the front and back yards including installation of lighting and sprinklers. Everyone was very professional and very nice to deal with. They did a beautiful job. I highly recommend them. Jamie and crew did a really beautiful job on my garden. Johnson's Landscaping provided us with a top-notch hardscaping and landscaping experience. Our property has been transformed. As usual, they did an excellent job. They left my property neat and in excellent condition. Thanks! Very good, solid service. They maintain our yard in an excellent manor. Great work, hardscaping, landscaping, outdoor lighting -- highly recommend ! Friendly knowledgeable staff with the best bouquets and flower arrangements. They were very professional and took obvious pride in their work. The workmanship is excellent, the crew was careful and pleasant, the office kept us informed of the project status and the design was better than we originally envisioned. The project addressed the need while also enhancing the beauty with an imaginative design. I’m very pleased. Excellent work in taking out two dead trees and replacing them (though we won't know if they "took" until the spring). The work is top quality - workers respectful and the designers wonderful. I highly recommend them. Great work, very professional crew. Joe Stark is knowledgeable and responsive and a pleasure to work with. We have used Johnson's lawn service for a number of years and have been very pleased with them. We highly recommend them. My lawn and gardens look lovely, and they remember specific requests that I've made. They are friendly and helpful, and they work hard. We like the one-stop approach.Instead of planting flowers in our gardens and pots ourselves, we now come home after work and it's all done. Johnson's Landscaping is the BEST - I have used them for over a decade now, for both hardscapes (patios, walkways, etc) as well as plantings. Johnson's always does a great job. They completely designed our backyard, including landscaping and patio, and we were thrilled. We have been extremely pleased with the designer, Joe Stark . Joe's insight for our patio/ pond design was exactly what we wanted. We were exceeding pleased with the work that Johnson's performed for us - a new driveway, walkway, garden wall and filling in an unused in ground pool. I am very pleased with the beautiful flagstone steps/porch which was done last year and now landscaping in my front yard. First rate. Johnson's Landscape does an excellent job maintaining my yard and planting quality plants when asked. Johnson's Landscaping is superb. I can tell from half a block away when they've been to my house, so very tidy and clean do things look. SInce going with Johnson's 4 years ago, I have been very pleased. They have been very responsive to my needs. Our design-build process makes your dream landscaping come true. Our design team doesn’t approach every client with the same solutions. The 5-step process ensures your voice is heard throughout. During planning, designing and executing, we consult with our clients to form the big picture and then drill down to the details. We aim to get everything right the first time, so your lawn grows with exactly the look you want. It’s the finer points in the design that really make your landscaping projects your own. If you tell us you want to lower your environmental impact, we can walk you through the native plants that will thrive in your gardens without needing external help. Or we can give you a plethora of options for rainwater collection. Want to entertain frequently? We can build seated gardens, patios with built-in grills or fireplaces that serve as a focal point for any gathering. And we’ll light it all as well, so you can use them at night. Concerned about erosion? We can plant your new vegetable garden in the raised area created by a retaining wall. Or build a rock garden in the bulkheads we install at the bottom of the slope. These are just a small slice of the solutions our expert designers can offer. We’ll have ideas for days. The most important part is that our consultative and interactive process makes sure you get exactly what you want. We will work hard to find an idea you love before we take the first measurement. Our builders have delighted clients with perfectly executed landscaping for decades. They work meticulously to flawlessly implement our plans. Our teams arrive at your home knowledgeable about the project with a thorough strategy for getting your landscape looking exactly how you want it to look. The foremen are happy to walk you through their execution plans and answer any questions that you have along the way. If you spot any problems, they’ll work closely with you and the designers to solve them promptly. Our crews will work quickly. This is where all our planning pays off because the crew knows precisely what to do and where to do it. They work tirelessly to pull off your vision as if it’s their own. When you look at your garden, what do you see? If you have no pride in your outdoor space, you need to take action. Your garden should be a communal area where you and your loved ones relax. If you have let your yard go, there is still time to salvage it! Give us a call today, and we will do everything we can to create the garden of your dreams. You deserve to enjoy the space you have, so why wait? 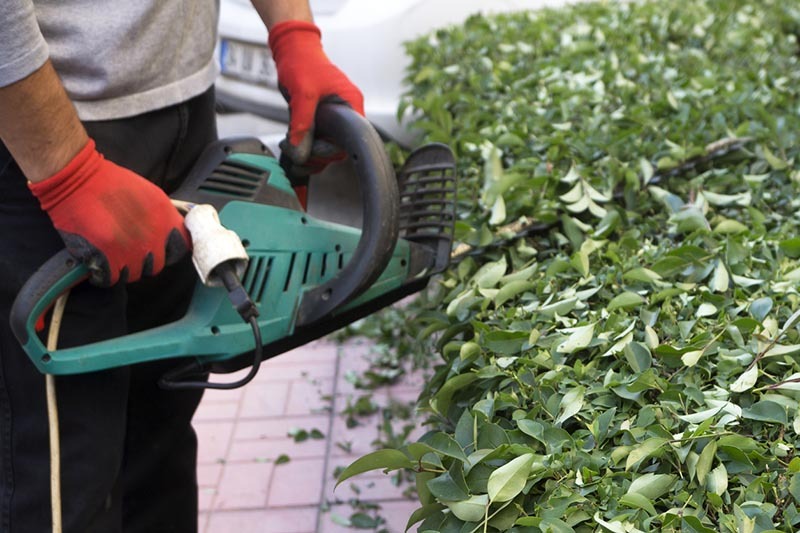 At Johnson’s Landscaping Service, we offer an array of services that will revamp any space. If you want to give your garden a new lease of life, look no further. 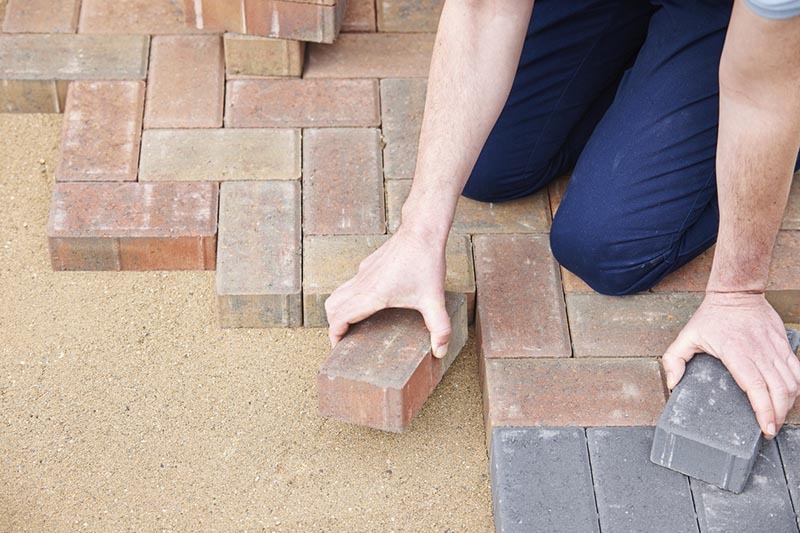 Our team of designers, gardeners and masons can help you with every step of the way. From the initial planning stage right through to the completion, we will support you. We can give you a rough timeline. That way, you will know when you can expect us to complete the project. We will also give you an accurate quote so there are no surprises. Most of our clients want low-maintenance gardens that will look great without much work on their parts. We can put in hearty plants that will weather droughts and floods with aplomb. If you want a more complex botanic bounty, but don’t want the maintenance hassle, fear not! We have an army of landscape maintenance experts ready to keep your new landscaping looking new. Whether you want a new walkway or an elegant patio, we can help you along the way. 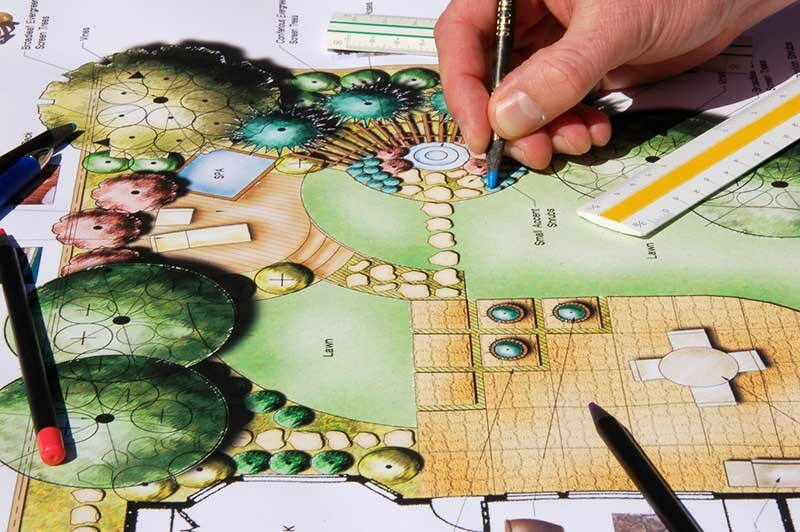 Our team of skilled experts can help you design features that will enhance your garden. We know that every space is different. That’s why we offer a tailor-made service to each of our clients. Our masons hold the highest levels of qualifications in the field. If you want somewhere you can relax, there is no better option than an exquisite patio area. These spaces are perfect for BBQs or chilling out in your garden. When you trust our team, we can help you create a stunning outdoor space where you and your family can unwind. Aside from that, we have a selection of other masonry services you might like. We also offer traditional steps, which can enhance the look of your home. If you want to add curb value to your home, this little feature might just do the job. 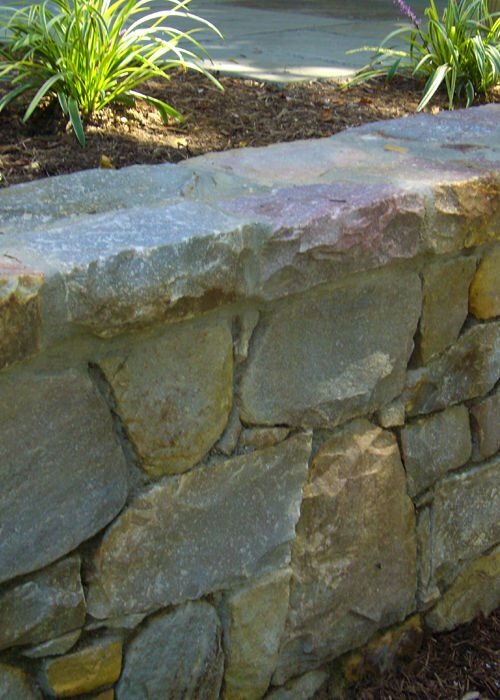 If you need an elegant stone wall in your garden, look no further. Our team can take you from the initial idea to the finished product. 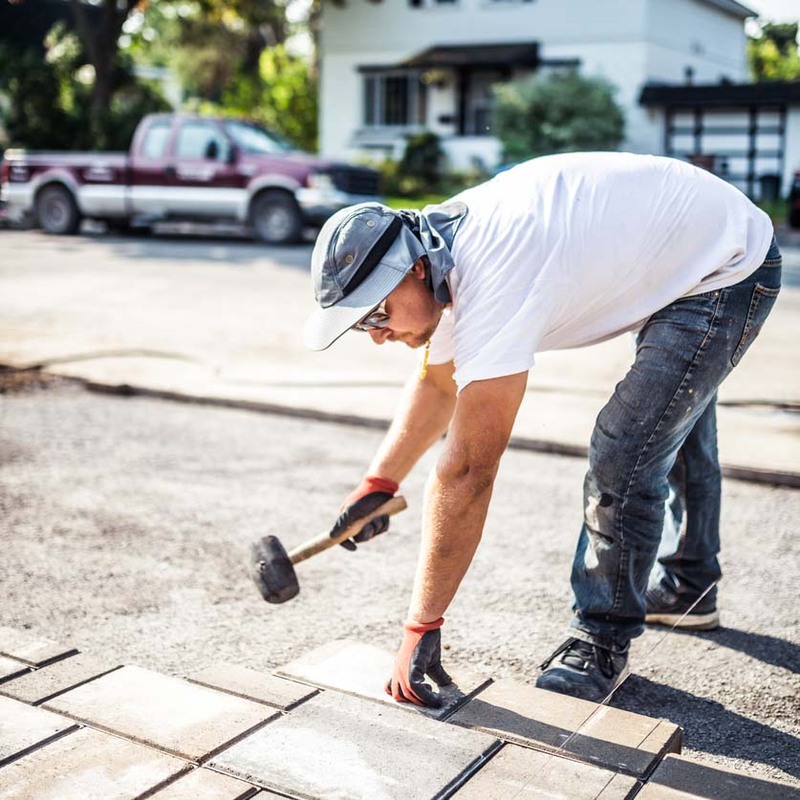 Each of our dedicated masons prides themselves on their ability to tackle any job — big or small. If you have something special in mind, please don’t hesitate to tell us. Our team will do everything they can to make sure that your garden looks as perfect as possible. After all, why should you have to settle for anything other than the best? One of our most popular services has to be lighting. We believe that exterior lighting is the final touch for any transformation. When you add this element to your outdoor space, it can make a massive difference. No matter what you have in mind, our team of experts can help you achieve the look you desire. After all, we want to make your vision a reality. Our lighting can transform your outdoor space. We can highlight certain element of your landscape with spot lighting of, say, your koi pond and rock garden. We can keep your parties going into the night with flood lighting of heavily trafficked areas. 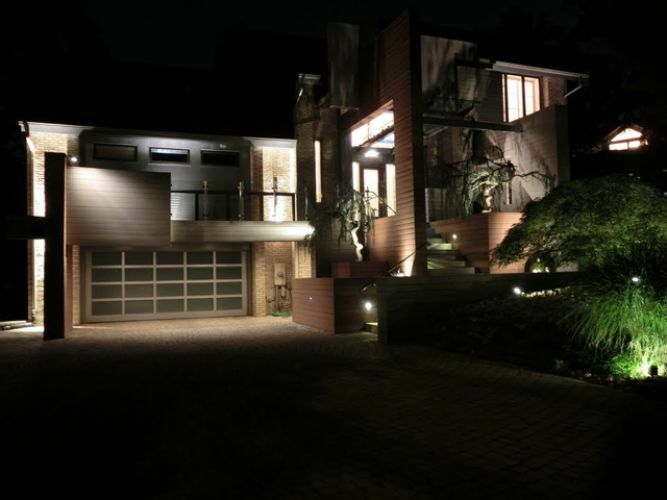 We can keep you home secure with motion-activated lighting around your entry points. Or we can make your walkways and steps safer with small lights around potential trouble spots. When you’ve spent so much time and money on transforming your outdoor living spaces, you want to put that perfect bow on top. Our lighting is your perfect bow.